Stagecoach South’s current MD, Andrew Dyer, is to retire in July after a career of over 40 years in the UK bus industry. He will be succeeded by Mike Watson with effect from 1 July 2015. Mike has been MD at Stagecoach South West for the past two years. A recruitment process is now underway to fill Mike’s role once he leaves. Andrew will formally retire on 11 July. He has 45 years of service in the bus industry, having worked with Stagecoach for 21 years, including two years at the company’s South West Trains rail franchise. His first role in public transport was in 1970 when he had a school holiday job in Oxfordshire sweeping floors and bus conducting. His first senior role was in 1980 as Transport Manager for Charlton-on-Otmoor Services, in Oxfordshire. Andrew then worked as a District Manager for the National Bus Company in Exeter and Cheltenham before joining Cheltenham & Gloucester Omnibus Co in 1986. He became Commercial Director and then MD of the business, which was bought by Stagecoach in 1993. After spending two years at South West Trains as General Manager, Wessex Division (in charge of the Weymouth and Exeter Lines) in the late 1990s, he was appointed MD of Stagecoach South in 1999, a post which he has held ever since. Mike Watson has been MD at Stagecoach South West since July 2013. He began his career in the bus industry in the service planning department at London Transport Buses in 1996. After five years in planning and procurement roles, he moved to Go-Ahead subsidiary Metrobus as Assistant Operations Manager. He has also worked for Go North East, as well as in consultancy roles. Before joining Stagecoach, he spent five years with Arriva, as General Manager of the St Helens depot and then as an Area Manager in Yorkshire. 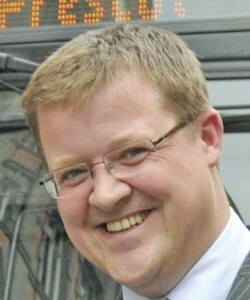 He joined Stagecoach as Operations Director at the North East business in November 2011.